Sierra Leone became part of the British Empire early in the 1700's, and its capital of Freetown was named because it was exactly that, a Free town. Sierra Leone's population was swelled with the return if Africans who did not want to live in England after the ending of Slavery. Also, the Royal Navy added to the population with its anti-slavery squadrons who turned slavers around. There was a huge uprising in 1898 against British rule, but it was brutally suppressed. There where other protests against Colonial rule, almost all the way up to independence. During Sierra Leone's time as part of the Empire, they used the standard Blue Ensign, defaced with a coat of arms created for the colony. The coat of arms was a simple roundel with a background of mountains, and a palm tree. In the foreground, a trumpeting elephant. Under the elephant, the letters "SL" for Sierra Leone. The process for independence really gained momentum in 1951 with the creation of a new constitution which allowed Sierra Leone a great deal of domestic rule. Sierra Leone finally gained its independence in 1961. With the start of a new independent Sierra Leone, came a new flag. The new flag was a horizontal tricolour of green, white, and blue. The green stands for the mountains of Sierra Leone, the white stands for unity and justice, and the blue stands for the harbour of Freetown, and for the hope that Sierra Leone will play a role in striving for peace in the world. 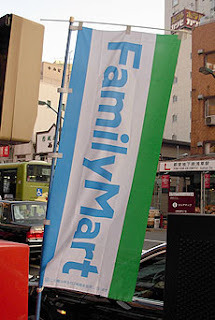 Interestingly, Sierra Leone's flag is confusingly linked with the convenience store chain "Family Mart" in Japan, where they share the same colours, and almost the same design! 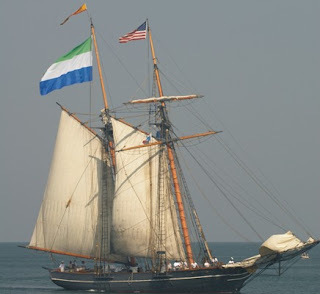 The flag of Sierra Leone has not been changed throughout the history of the nation, despite going through several periods of great unrest.